The concept of XTM 2 is timelessly simple. You control a tank, with a big gun, and your job is to blast anything stupid enough to get in your way. The developers of XTM 2 brought the concept to life and the result is a fun arcade romp. First things first, the gameplay. 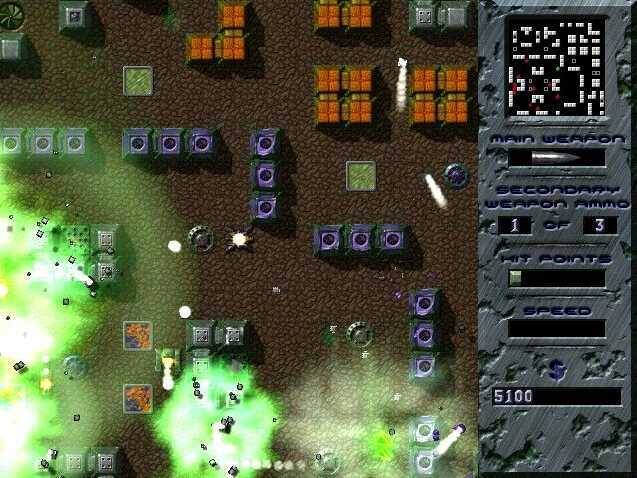 The shareware version of the game lets you take control of one of 3 tanks. Each play slightly differently, adding some strategy to the game. There is a light tank, a medium tank, and a heavy tank (The Toxy Crab, heheh, great name.) Your tank has three ways it can attack. You have your main weapon, which has unlimited ammo, as well as a secondary weapon which does a lot of damage, but has very limited ammo. There is also a plunging fire mode, which lets you shoot over obstacles. The downside is you have to be standing still and take your time to aim to pull the last one off. It makes for some tense moments as you try to get off a shot without an enemy tank shooting you in the back. Levels are fairly simple. The game is played from a top-down perspective and most of the levels are very small. They contain walls and other obstacles which you can hide behind as well as teleport pads and repair pads which can heal your tank. The graphics in XTM 2 are very well done. The level tiles look crisp and clean and the tanks have a cool glowing effect under them when they move (they are hover tanks after all). 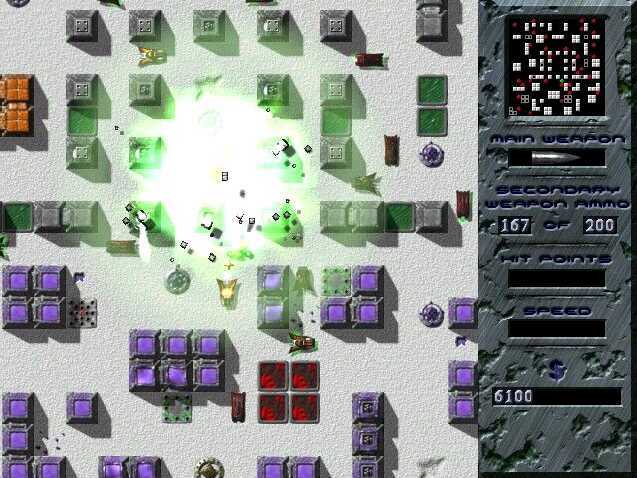 The highlight of the game in terms of graphics though, are the explosions and particle effects. Huge explosions will light up the screen. The tanks themselves are very particlelicious, bits of them will spew off when they are hit. The game also features some very nice smoke effects. The game features three game types, Campaign, Skirmish, and Arcade. Skirmish mode wasn't available in the shareware, so I don't know what it does. In Arcade mode, you simply pick a tank, pick a level, and fight until you die. In campaign mode, you take on tougher and tougher levels in order, but the upside is you get access to the Upgrade Center, which lets you upgrade and customize your tank to your desire. Music and sound effects in the game are well done. Explosions in particular have nice sound effects. If you like techno, you'll like the music. If you don't, you'll find yourself turning it down very soon. The game does have a few problems, however. First, although a lot of fun at first, the gameplay does get repetitive after a while. 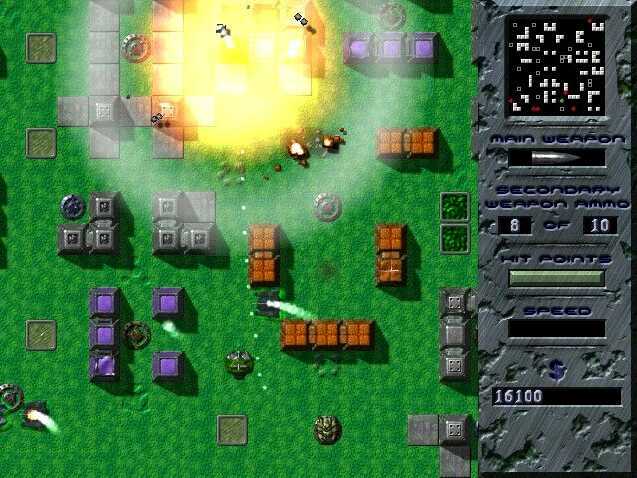 The problem is that all you can do is blow up tanks, there are no missions or other objectives (at least in the shareware). This would have been allieviated a lot by a multiplayer mode, unfortunately the game doesn't have one. Some of the interface text is also quite hard to read, which strains the eyes. Overall though, XTM 2 is a fun game with good graphics and sound. Check it out if you're ever in need of an arcade diversion.